The authenticity of host '129.213.136.114 (129.213.136.114)' can't be establishe d.
RSA key fingerprint is SHA256:M1nYMnHul6e0Mpb3llWcJovCwyJBVD+iNOLQz6q1niI. Warning: Permanently added '129.213.136.114' (RSA) to the list of known hosts. Service "83e996f4d58506f6e0532700000a2d76.sub05111533480.vcn0511153348.oraclevcn.com" has 1 instance(s). Service "ocidbXDB.sub05111533480.vcn0511153348.oraclevcn.com" has 1 instance(s). Service "ocidb_iad1sp.sub05111533480.vcn0511153348.oraclevcn.com" has 1 instance(s). Service "ocidb_pdb1.sub05111533480.vcn0511153348.oraclevcn.com" has 1 instance(s). 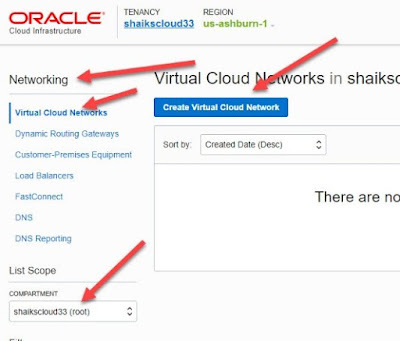 Service "shaik_pdb.sub05111533480.vcn0511153348.oraclevcn.com" has 1 instance(s). Whitepaper on inter node communications between different networks (VCNs) in Oracle Cloud Infrastructure. Part-1: Configure instances to access Internet. we will create compartments, VCNs and Subnets. 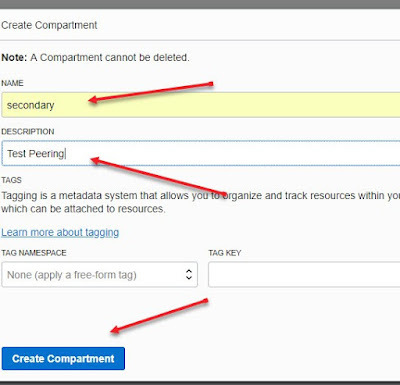 Part-2: Configure Instances to access Internet in Primary & Secondary compartment. We will create Internet Gateway, Instances and configure Security Lists & Route tables. Part-3: Setup VCN peering between instances. 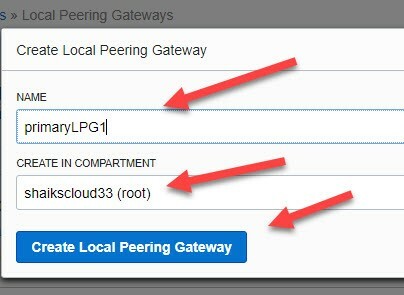 We will create Local Peering Gateways (LPG), establish connection between LPGs and Configure Route Tables. Part-4: Configure password less SSH connection between instances. Generate SSH keys, Transfer SSH keys between Instances and Configure Route tables. 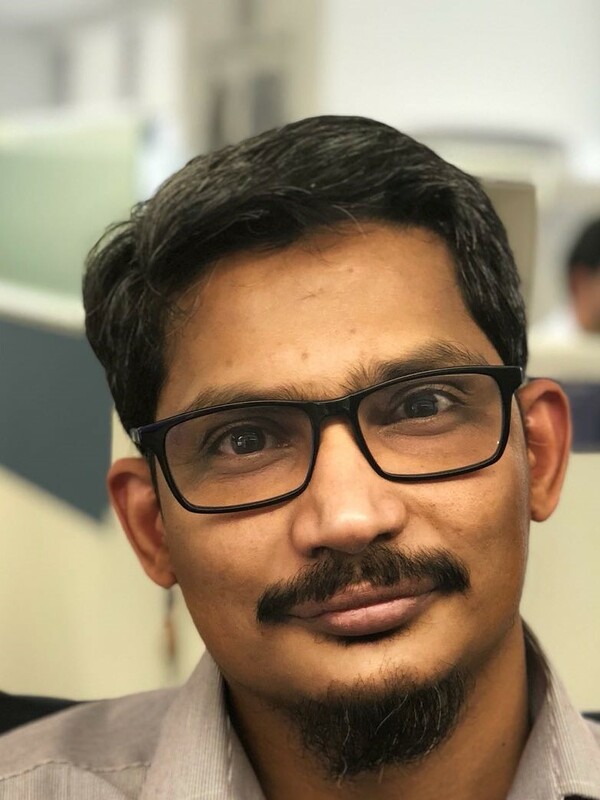 In the current cloud computing world there is always a need to setup communication between instances residing in different VCNs to configure high availability for an application or due to 3 tier architecture models or for various other reasons. This document guides you through the necessary steps needed to establish communication between instances residing in different VCNs, separate compartments and in separate Availability Domains. This document also walks you through on how to create the following cloud resources and other important setups. 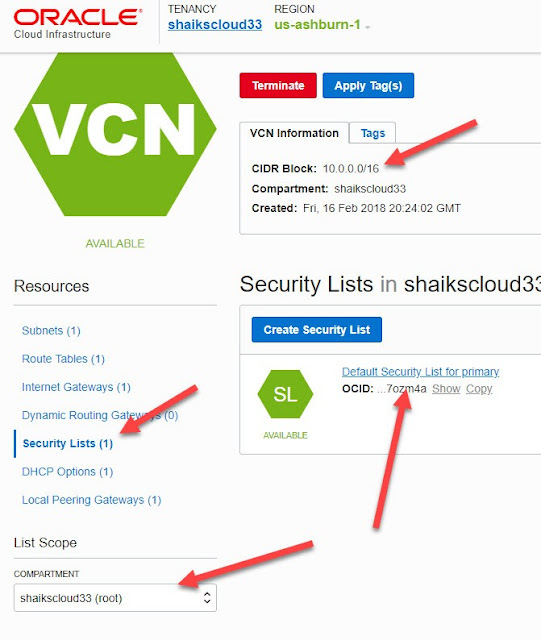 · Compartments, Virtual Cloud Networks, Subnets, Setup Route Tables, Configure security rules. 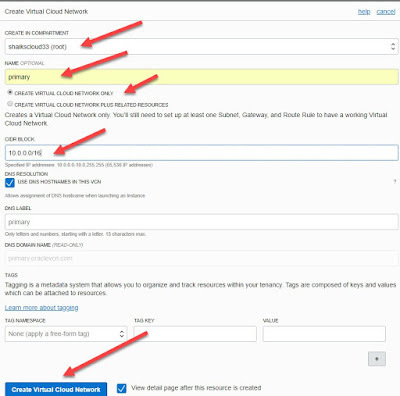 · Access Internet from Oracle Cloud Infrastructure Instances. · Setup Inter Node communication between Instances. · Setup Password less SSH connection between Instances. 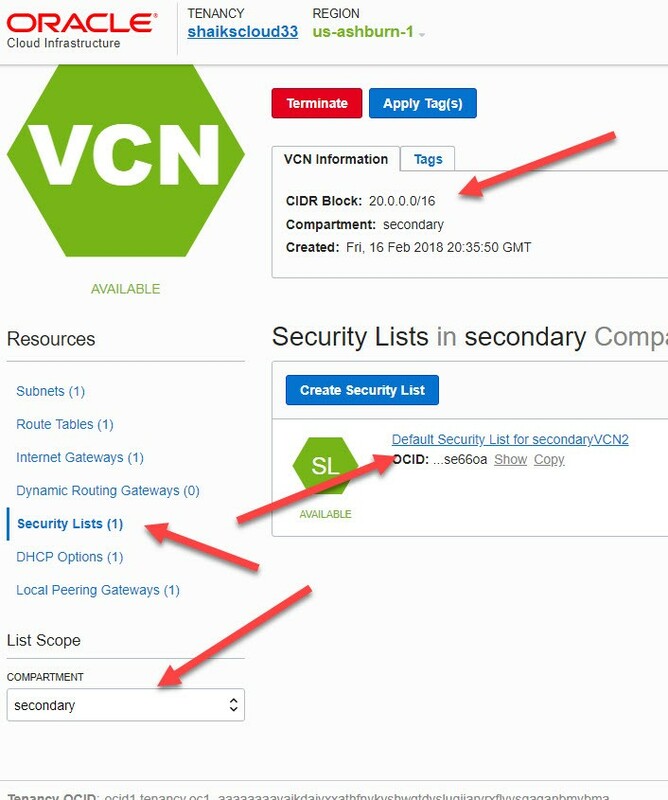 Scope of this document is to provide the reader with quick steps on how to setup VCN local peering between Instances in two different VCNs. This document should not be used as a complete reference guide for any production deployments. Instructions/steps provided in this document are for informational and testing purposes only. The author is not responsible for any mistakes/damages/security flaws caused by the following steps. Configuring Peering between regions is beyond the scope of this document. 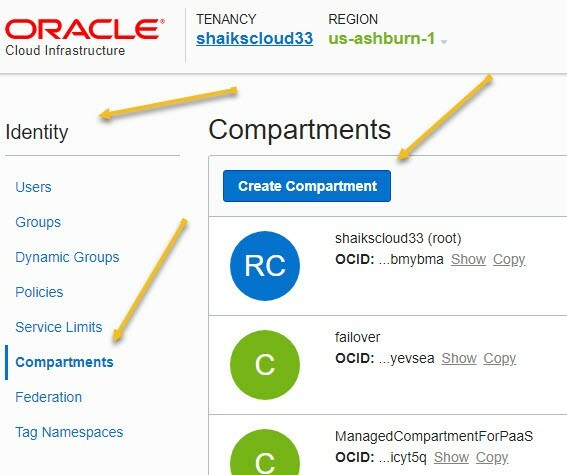 This document assumes that the reader understands Oracle Cloud infrastructure architecture and has sound networking knowledge. 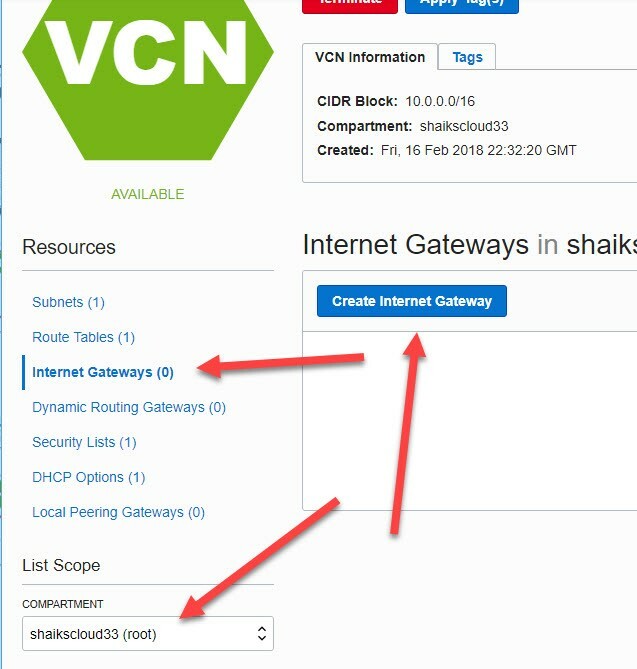 The reader should also have working cloud account with privileges to create network components like VCN, IGW, INSTANCES. A VCN is a soft­­ware defined virtual network in Oracle Cloud Infrastructure. A VCN offers you complete control over your cloud network environment. 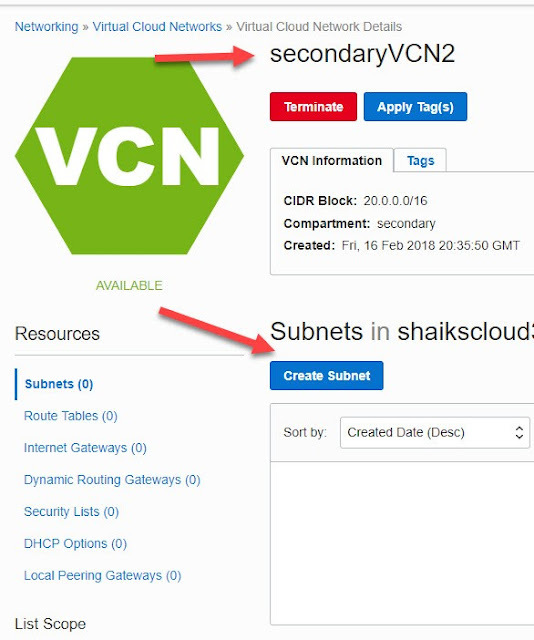 VCN offers CIDR ranges from /16 to /30, and you can assign your own private IP addresses, create subnets, create route tables and firewalls. 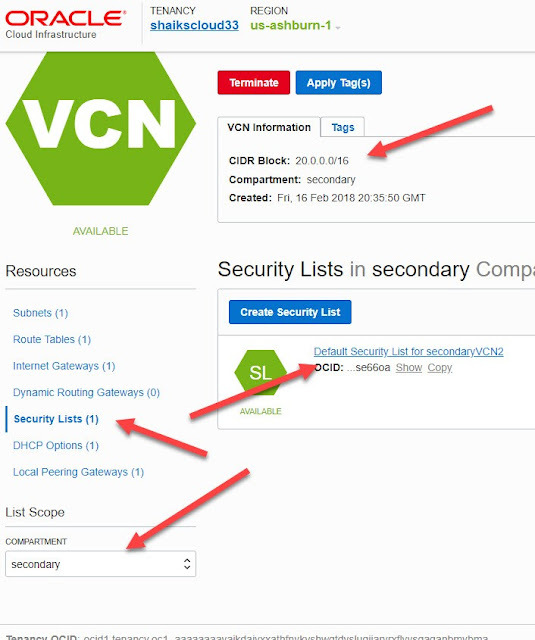 You can have multiple VCNs to provide grouping and isolation between related resources. The scope of VCN is limited to all Availability Domains(ADs) in a region. Peering is a process of connecting multiple VCNs so that traffic can be routed between them privately. 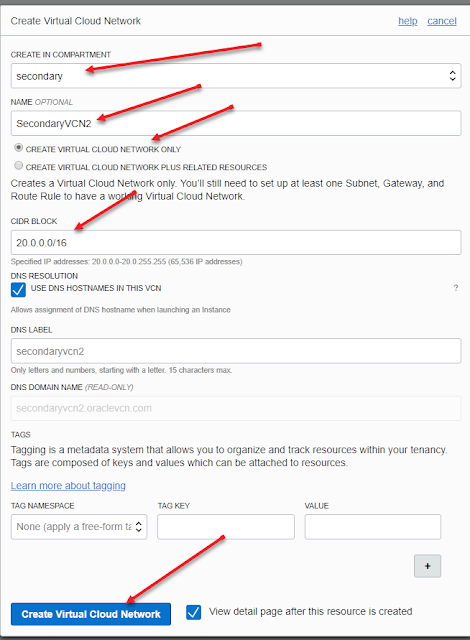 By default, instances from one VCN cannot communicate to instances in another VCN. You can configure peering between VCNs using LOCAL Peering Gateways so that instances from one VCN can communicate with instance in another VCN as if they are in the same network. VCN peering is currently allowed between same tenants and within a single region. 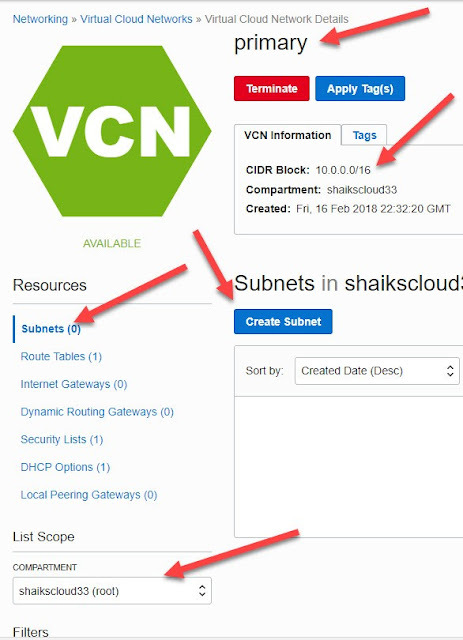 Subnet: A subnet is a range of IP addresses within a VCN providing logical isolation for resource groups. Security List: A set of stateful virtual firewall rules associated with a subnet. Security Lists consists of Ingress (Inbound) and Egress (Outbound) firewall rules. 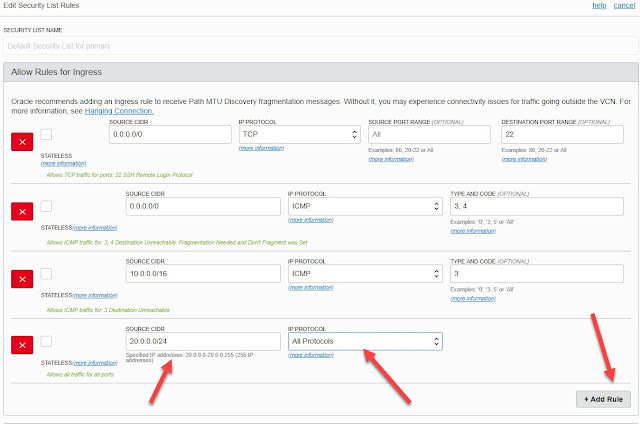 Security lists are attached to an instance at the time of instance launch. Route Table: A set of virtual route rules, viewed in table format. Route table provides mapping for the network traffic from subnets to destination address via gateways. DHCP Options: IP address of a custom DNS server provided during instance launch. 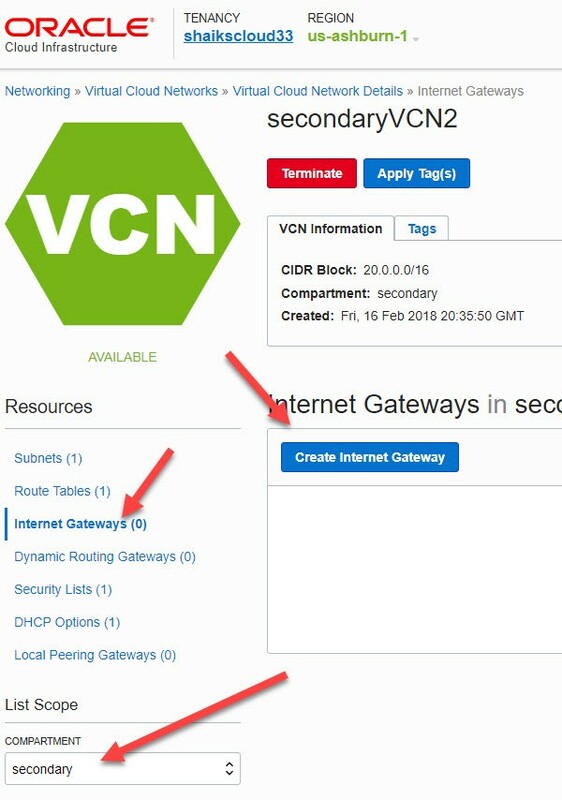 Internet Gateway: A software-defined virtual router providing a path for network traffic from your VCN to the public internet. 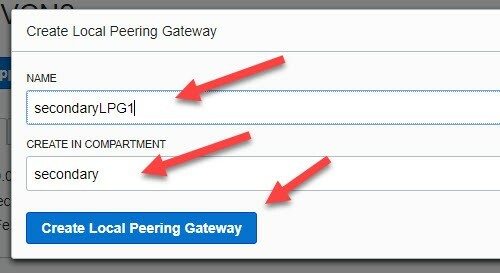 Local Peering Gateway: is a software-defined virtual router providing a path for network traffic from one VCN to another VCN. It is used for local VNC peering. The Figure 1 outlines the VCN peering architecture and how its core components interact with each other. There is no charge for creating VCNs and using them. There are no data transfer charges for any communication among resources within a VCN. Figure 2 shows cloud resource names, CIDR block ranges and IP addresses that have been used throughout this document. 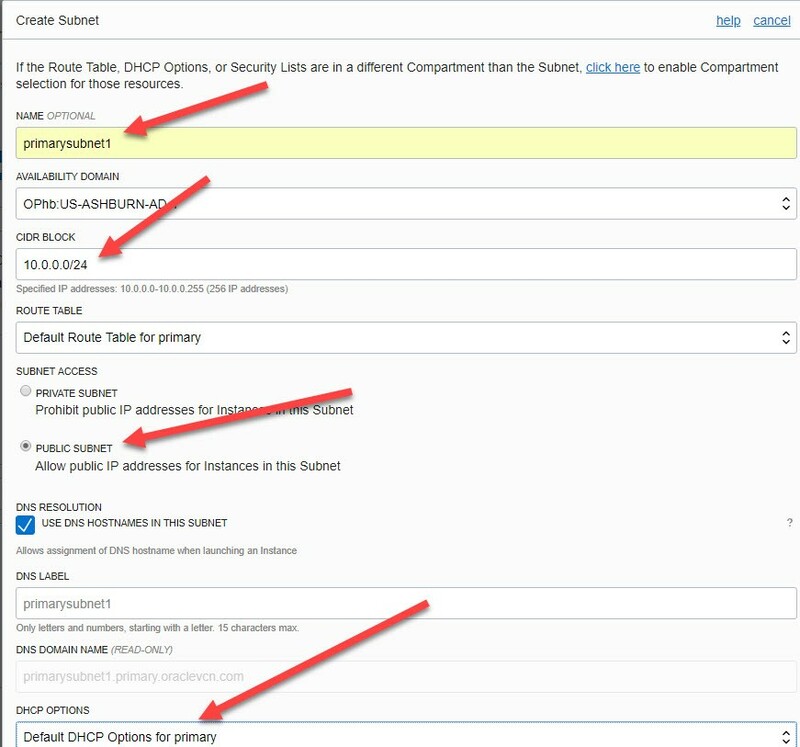 Gateway, Instances and configure Security Lists & Route tables. connection between LPGs and Configure Route Tables. 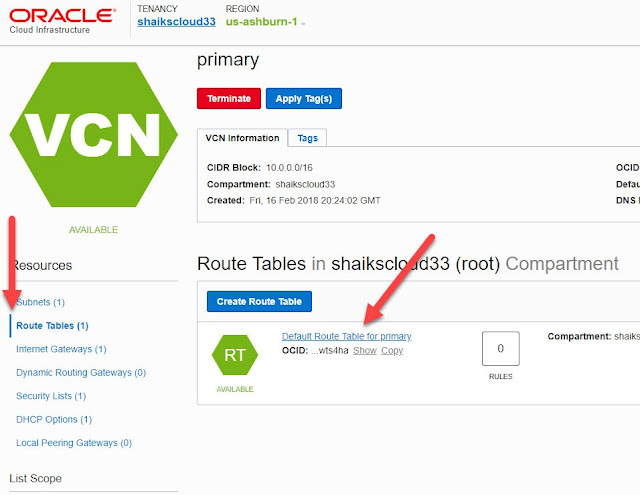 between Instances and Configure Route tables. We will be using two compartments for our setup; root compartment and secondary compartment. Root compartment will be used as Primary compartment. Figure 3 highlights the steps for root compartment. Primary cloud resources will be deployed in root compartment and all the secondary cloud resources will be deployed in Secondary compartment. Figure 4 specifys the steps for creating secondary compartment. 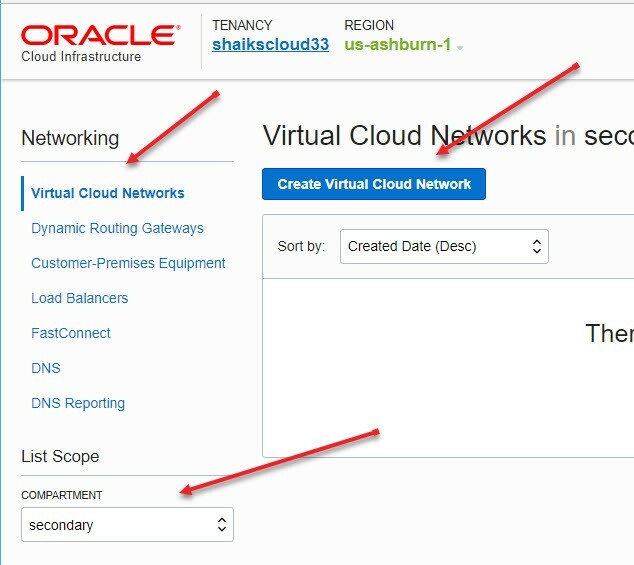 2. click on create Virtual Cloud Network. Figure 5 is for reference. 3. Select Virtual Cloud Network Only. Figure 6 is for reference. 4. Select à Default DHCP options and Default security lists. 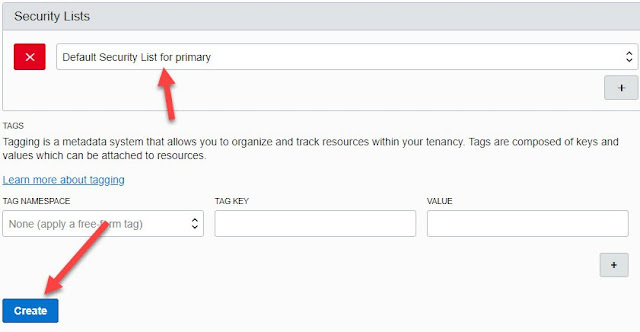 Wait until you see that Subnet is created and turns the status of the subnet to Available. Figure 10 is for reference. 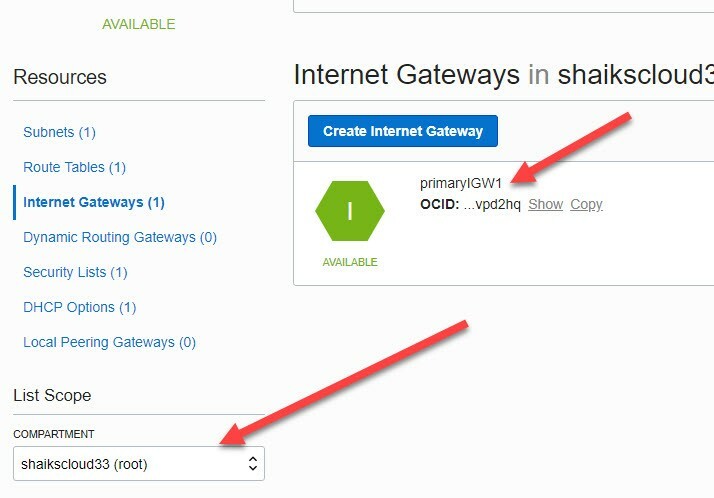 Provide the name as PrimaryIGW1 and click Create Internet Gateway. Make sure that PrimaryIGW1 is in Available state as shown in the Figure 13. Now we need to configure Route tables to allow network traffic to passthrough Internet Gateway. In our example we are using default Route tables and we will modify the default route table in our Primary VCN to allow internet traffic. Figure 14 is for reference. 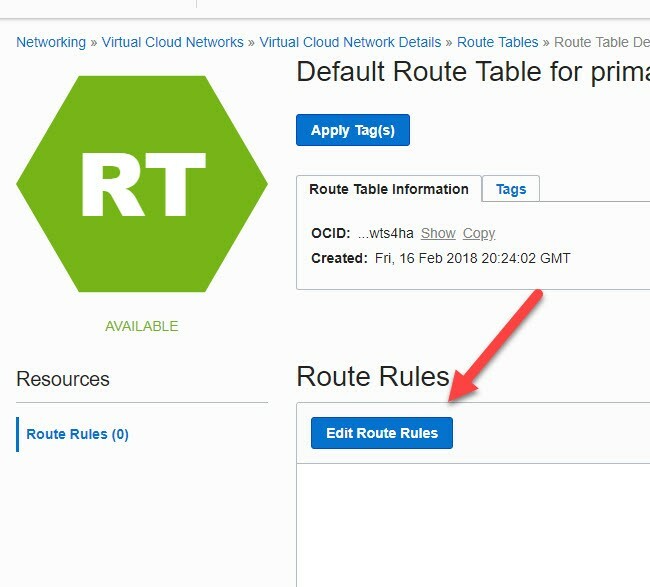 Select the Default Route Table for Primary VCN and edit Route Rules as shown in Figure 15 below. Figure 18 Route rule addition confirmation. Go to Primary (root) compartment and select Compute à Instances. 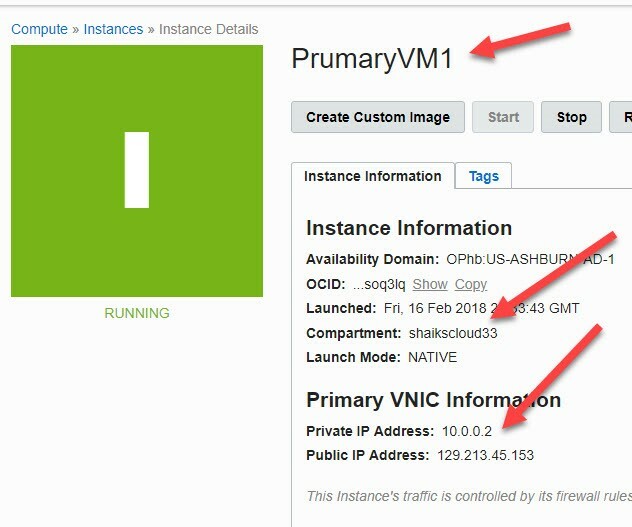 Click on Launch Instance as shown in Figure 19. Figure 19 Launch Instance in Primary Compartment. Step – 4: Create VCN in Secondary compartment. Change compartment to Secondary in the bottom left and select Virtual Cloud Networks. 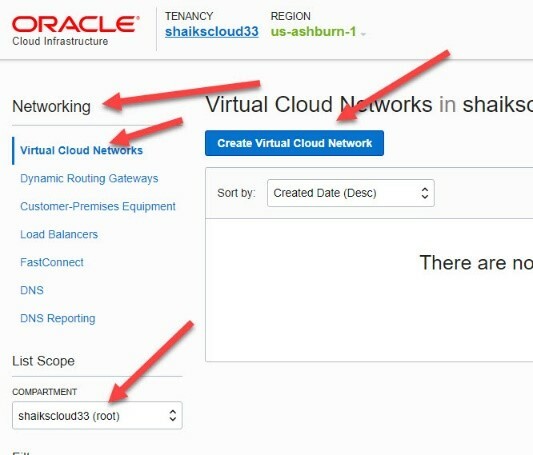 Click on Create Virtual Cloud Network. In SecondaryVCN2 select Subnets and click on Create Subnet with the below values. Create subnet with values shown in Figure 24. 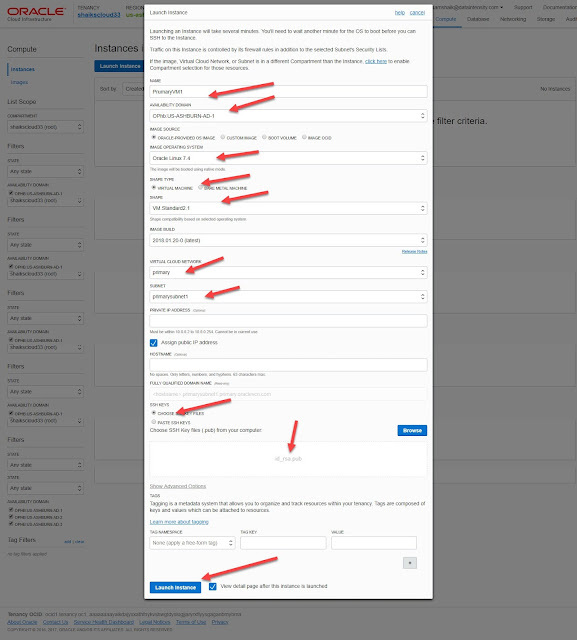 · Select à Default DHCP options and Default security lists. Figure 26 Create Internet Gateway in Secondary Compartment. 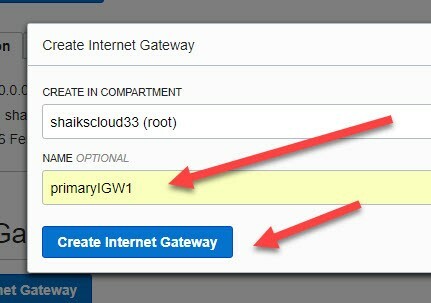 Provide the name as SecondaryIGW1 and click Create Internet Gateway. Make sure that SecondaryIGW1 is in Available state. Now we need to configure Route tables to allow network traffic to passthrough Internet Gateway. 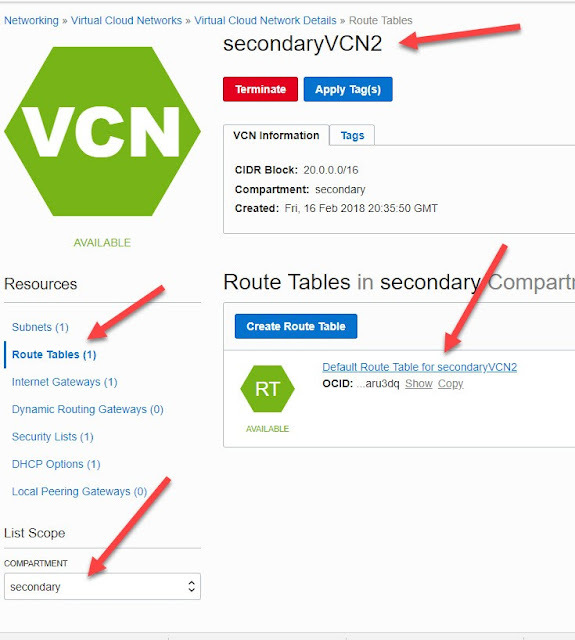 In our example we are using default Route tables and we will modify the default route table in SecondaryVCN2 to allow internet traffic. Figure 28 Add Route rule to allow internet traffic via Secondary Internet Gateway. Choose the Below options for Instance Launch in Secondary Compartment, Figure 29. Figure 29 Launch Instance in Secondary compartment. 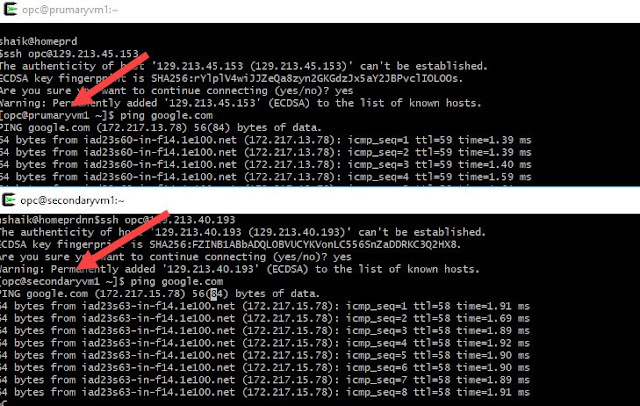 Login into instances using their Public IPs as shown below in Figure 30 and ping any public URL. Here we will ping www.google.com and we should see the successful packet transfers. 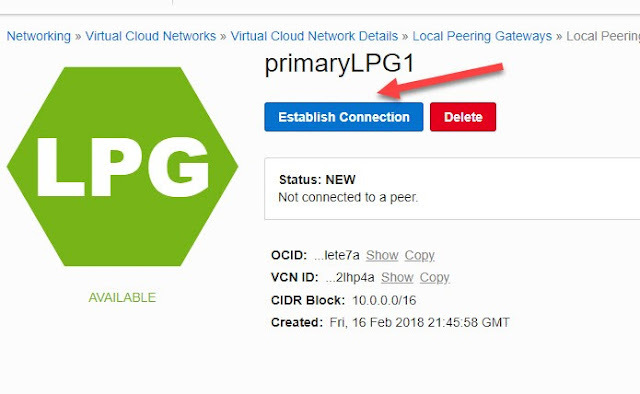 In this part, we will create Local Peering Gateways (LPG) in Primary & Secondary compartments, establish private connection between LPGs and Configure Route Tables to allow network traffic to pass through LPGs. The steps for doing so are listed below. Select Secondary compartment -> Networking -> Virtual Cloud Networks -> SecondaryVCN2 -> Local Peering Gateway. You need to establish connection only once between two LPGs and it doesn’t really matter which LPG you pick to establish the connection from. 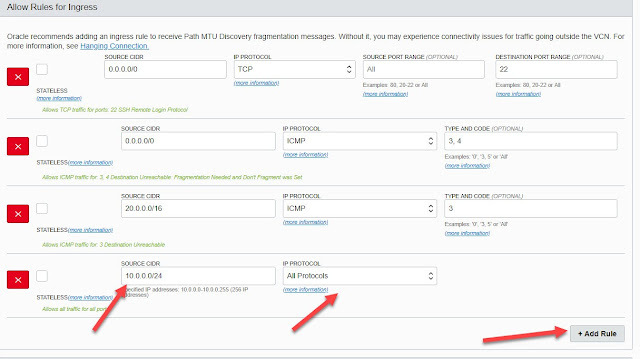 So far, we have created LPGs and bridged a connection between LPGs but the instances in the two VCNs cannot communicate yet due to the Firewall restrictions. 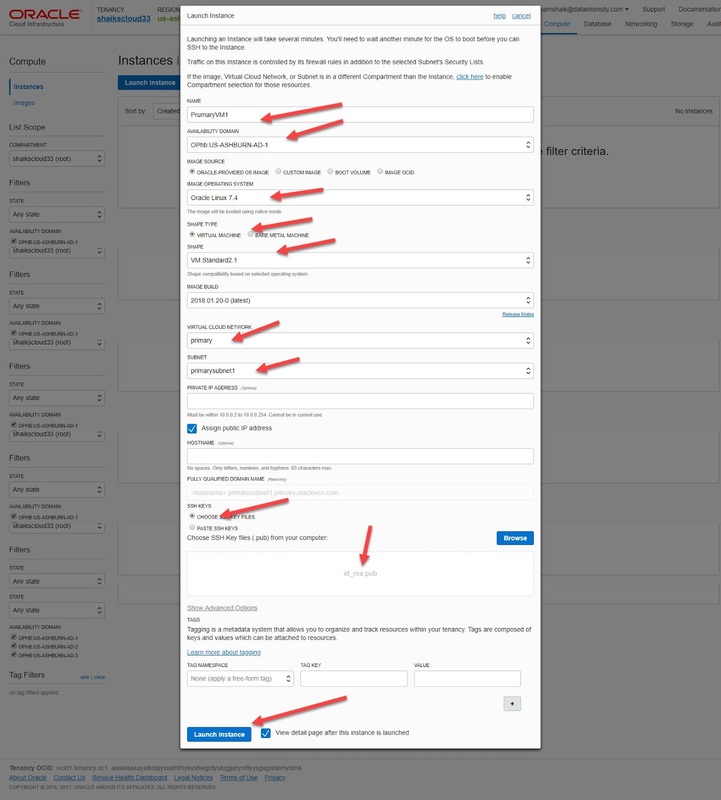 In this section we will configure Route tables and modify Security Lists to ease Firewall restrictions and allow network traffic from the instances to passthrough Local Peering Gateway. In our example we are using default Route tables and we will modify the default route table in our Primary & Secondary VCN to allow destination LPG CIDR traffic to pass through. Add new Route Rule to route network traffic from SecondaryLPG1 to destination CIDR block 10.0.0.0/24 as shown in Figure 39. 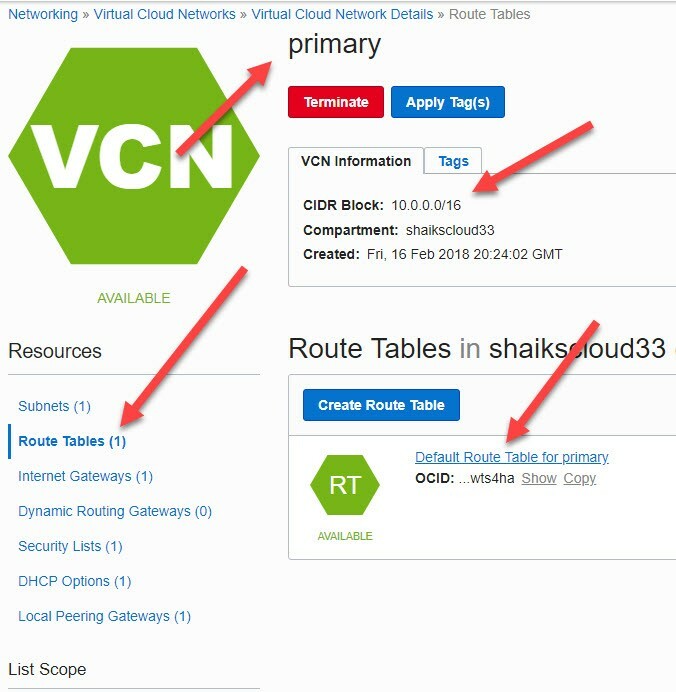 Select Primary (root) compartment à Networking à Virtual Cloud Networks à Primary VCN à Route Tables à Default Route Table. Add new Route Rule to route network traffic from PrimaryLPG1 to destination CIDR block 20.0.0.0/24 as shown in Figure 42. Now edit Default security list in SecondaryVCN2 to allow all protocols from CIDR block range 10.0.0.0/24 into SecondaryVCN2. Select Secondary compartment  Networking  Virtual Cloud Networks  SecondaryVCN2 à Default Security List à Add Rule. Add rule to allow all protocols from CIDR block range 10.0.0.0/24 into SecondaryVCN2 as shown in Figure 44. Now edit Default security list in Primary VCN to allow all protocols from CIDR block range 20.0.0.0/24 into primary VCN. Select Primary (root) compartment à Networking à Virtual Cloud Networks à Primary VCN à Default Security List à Add Rule. Add rule to allow all protocols from CIDR block range 20.0.0.0/24 into Primary VCN as shown in Figure 46. 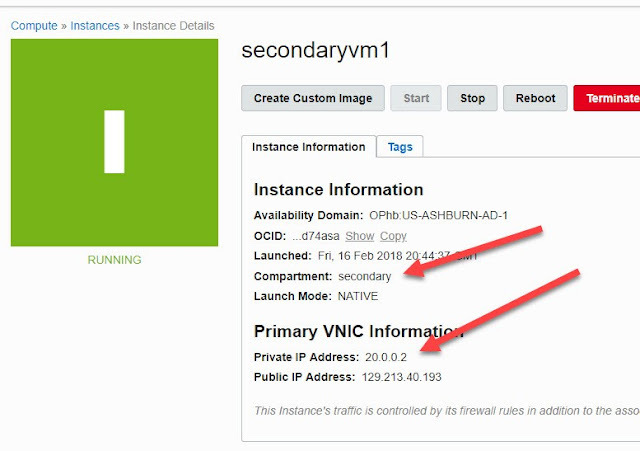 Note down the public and Private IP addresses of instances in PrimaryVCN and SecondaryVCN. 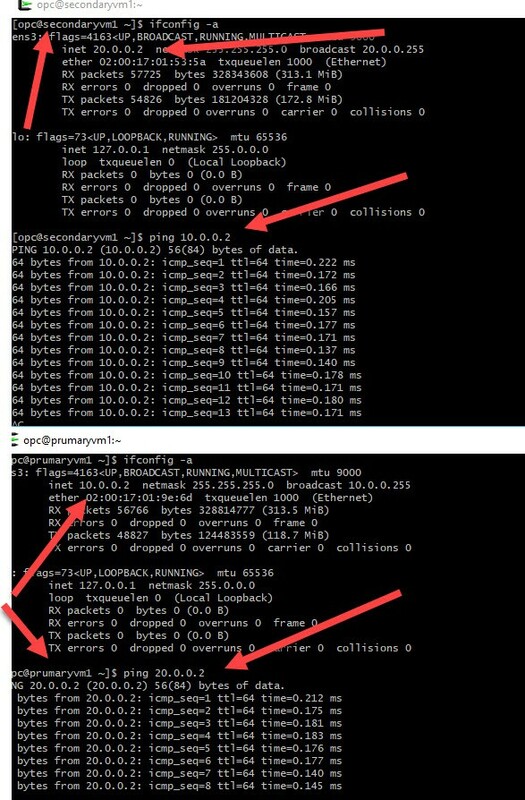 Login into PrimaryVM1 as opc user and ping the private IP address of the SecondaryVM1 you should be able to see the packet response from SecondaryVM1. PING 20.0.0.2 (20.0.0.2) 56(84) bytes of data. We will generate ssh rsa keys without any passphrase for simplicity and then add the public key id_rsa.pub into PrimaryVM1’s ~/.ssh/authorized_keys file to enable password less login for opc user. Your identification has been saved in /home/opc/.ssh/id_rsa. Your public key has been saved in /home/opc/.ssh/id_rsa.pub. Either scp public key or copy and paste into authorized_keys file in primaryVM1 host. Generate SSH RSA keys on PrimaryVM1 and add the public key id_rsa.pub into SecondaryVM1’s ~/.ssh/authorized_keys file to enable password less login for opc user. The authenticity of host '20.0.0.2 (20.0.0.2)' can't be established. Warning: Permanently added '20.0.0.2' (ECDSA) to the list of known hosts.